Great News!! Cable and Wireless have partnered with the Wikimedia Foundation to allow mobile customers to surf and enjoy Wikimedia Services websites while at their home markets for FREE. This means once our mobile customers surf the Wikimedia websites their data usage will not deplete and they will NOT be charged data rates. What our mobile customers have to do? Just surf the Wikimedia websites!! A banner "Learn something new with Flow" will appear on the top of each page of the zero-rated mobile website. Wikipedia is the world's largest and most popular encyclopedia. It is online, free to use for any purpose, and free of advertising. Wikipedia contains more than 35 million volunteer-authored articles in over 291 languages, and is visited by more than 374 million people every month, making it one of the most popular sites in the world. Wikipedia is a global movement to spread knowledge to every person on the planet through the world'slargest freely licensed encyclopedia. The Wikimedia Foundation is the non-profit organization that operates Wikipedia and other free knowledge projects. Together these sites are the fifth most visited web property in the world. 2. What is Wikipedia Zero? "Wikipedia Zero" is a service to access Wikimedia websites whichdoes not result in a data charge to our mobile customers. 3. What Wikimedia services can I surf for free? "Wikimedia Service" means Wikipedia, Wiktionary, Wikiquote, Wikibooks, Wikisource, Wikispecies, Wikinews, Wikiversity, Wikivoyage, Wikimedia Commons, Wikidata, MediaWiki, Meta-Wiki, and Incubator (collectively, "Wikimedia site") in all languages delivered through channels including Wikimedia sites (including m.wikipedia.org); desktop version of the Wikimedia sites; Wikipedia Android app; Wikipedia iOS app. 4. Can I access Wikipedia app and enjoy the Wikipedia Zero? Yes you can download the Wikipedia app and enjoy Wikipedia Zero, however you will be charged the relevant datarates for downloading the Wikipedia app. 5. What are the benefits of Wikipedia Zero? Cable and Wireless and Wikipedia have extended this valuable service to our mobile customers, while also supporting our countries' economic and societal development. As we extend this valuable service to our mobile customers, we zero rated the data charges and also the data usage will not be depleted. 6. Who can access Wikipedia Zero? 7. What happens if I don't reside in the above countries but use the Wikimedia services? You can enjoy the Wikimedia websites, but you will charged the relevant data rates. 8. If I am roaming will I enjoy the Wikipedia Zero benefits? You can use the Wikimedia services while roaming but you will be charged the data roaming rates. 9. If I am roaming in the countries where there is Wikipedia Zero, will the mobile data be free? 10. 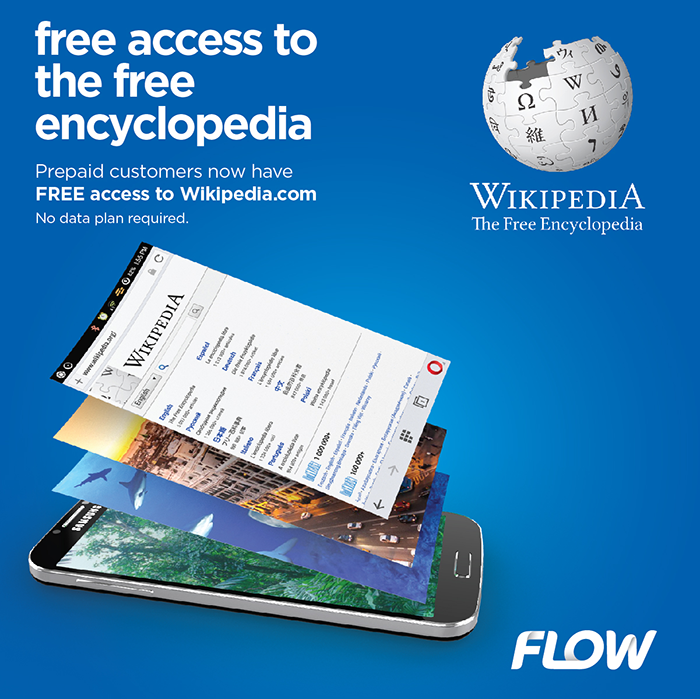 How do I know I am surfing Wikimedia service free without incurring data charges? On the Wikipedia zero rated websites a banner "Learn something new with Flow" will be shown. This Wikipedia Zero services is only applicable in your home country and if you are roaming you will not see the banner. 11. If I have not seen the "Learn something new with Flow"banner for Wikipedia Zero what should I do? If you have not seen a banner try the following options: " Make sure the mobile phone is set for Cellular Data access and not Wi-Fi. " Refreshing the page or navigating to a different Wikipedia page. " Try a different browser. Remember some proxy type browsers may not be zero rated, " Try another phone. " If all of the above attempts fail, and the test should be active, then enter http://zero.wikipedia.org. Please report the content of this screen to Wikimedia. 12. When I surf other sites how will I know I am be charged data rates? Once you stop surfing the Wikimedia websites and surf on other websites a warning statement will be shown indicating you will now be charged data rates.